Home Articles Car & Driving Technology Dockless Confidential: Are All of These Shared Bikes and Scooters a Good Thing? Dockless Confidential: Are All of These Shared Bikes and Scooters a Good Thing? 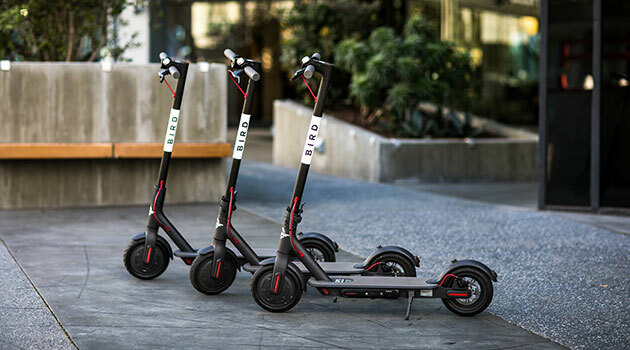 Dockless transportation—including vehicles like these Bird scooters—are becoming increasingly common in U.S. cities. It’s a bird! It’s a plane! No wait, it’s actually a Bird! If you’ve been to San Diego recently, you’ve definitely seen them: the buzzy electric scooters, known as Birds, that have taken the seaside town by storm. The battery-powered platform is the latest entrant to the dockless transportation phenomenon emerging along the California coastline and beginning to migrate across the country. Activated by mobile app, the electric scooters can be “started” anywhere they happen to be found—and are just as easily left behind when the user is through with their ride. Similar business models have sprouted up everywhere around the San Diego area. At least five dockless bike and scooter companies are currently vying for rides in the perma-sunny locale. Users pay a nominal starting fee to “unlock” the vehicle, then are charged by the minute or mile. And when the ride ends—wherever it happens to end—the bike or scooter is meant to be left by its user in a safe and convenient location, waiting for its next rider to come along. Their instant and infinite accessibility has made the bikes, and especially the Birds, immensely popular in an increasingly on-demand culture. But that same lack of restraint has left the vehicles vulnerable to some of the less-attractive whims of society—and not everyone thinks they should be able to fly so free. The concept of bike sharing has been around for years, first initiated in Amsterdam in 1965. While the idea spread through Europe in the ensuing decades, it didn’t jump the pond until 2008. That’s when Washington, D.C. initiated the first stateside pilot program called SmartBike DC, which included 120 cycles spread out over 10 stations. But the idea really took off in America in 2010, when a number of other cities, inspired by the D.C. program’s success, launched their own bike sharing systems. Since then, the country has taken more than 88 million collective rides on the communal cycles, including more than 28 million rides in 2016 alone. And the concept has only grown in popularity, with the 2016 total a full 10% higher than the number of rides recorded in 2011. All told, the U.S. is home to 55 bike sharing companies, with a cumulative fleet totaling more than 42,000 cycles. The U.S. is home to 55 bike sharing companies, with a cumulative fleet of more than 42,000 cycles. Still, a few hiccups in the business model have threatened to turn the concept into a novelty. Traditional bike sharing schemes require some background knowledge—or at least a serendipitous turn—to locate an available dock. And even in Seattle, a city renowned for its embrace of pedal pushing, issues arose for a short-lived bike sharing initiative called Pronto. That service was forced to shutter operations within three years due to flagging ridership, blamed on everything from the region’s weather to its strict helmet laws. But taking the popular idea and making it dockless, many argue, only increases its appeal, with a more streamlined, sleeker, and always-available business model that matches the pace of the times. And the numbers may back them up. Perhaps unsurprisingly, communal dockless cycles were first set free in China, a vanguard of both emerging technology and rapid urbanization. And, according to Mobike, the cycles have been put to good use. Across the Pacific, the concept has allowed Seattle to make a swift recovery from the Pronto program flop, with the city now housing more than 9,000 dockless bikes—the largest fleet of shared cycles in the country outside of Dallas and New York City—responsible for providing tens of thousands of daily trips. Indeed, the freewheeling transportation can increasingly be seen everywhere along the West Coast—including hotspots San Diego, San Francisco, and Los Angeles. But that they can be found anywhere is half the fun. On a busy holiday weekend in San Diego, thousands of out-of-towners flood the beachside city to soak up its sun and shores—and its scooters are becoming increasingly popular. The vehicles may seem ubiquitous, but to secure a ride, users must first track them down. Apps for each company include radar screens showing the scatterplot of available Birds or bikes in the area. First-timers then must upload a photo of their driver’s license (for Bird’s motorized transportation) and promise to obey all local traffic and helmet laws (for all of the rides) before they can unlock the cycle or scooter. All in all, it’s a speedy and simple process, and those who had already secured a ride made for quick converts. 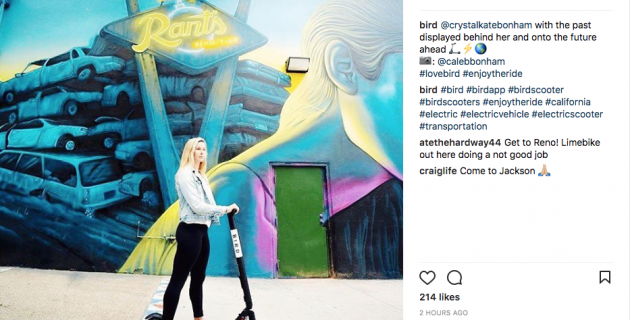 And even locals who had first tested the concept six months ago, when San Diego was initially seeded with the dockless bikes, were still interested—especially in the motorized Birds. “We used to use the bikes at first, and then the scooters started coming out, and we said, ‘Hey, the bikes were fun. Let’s try the scooters,’” said San Diego native Ceanna Vasquez, out cruising the beachy streets on a beautiful sunny day with husband Steven. While it’s difficult to track down exactly how many of the vehicles have made their way to the Finest City, they have unquestionably made it all around the area. Monetarily it also makes sense. More traditional bike share models in which each vehicle must be returned to a home base can run up a cost of nearly $5,000 per bike. The technology used to make the vehicles dockless is much cheaper and allows operators to turn a profit at much lower rates—sometimes as little as one ride per vehicle per day. And the financial freedom is being paid forward, with the rides making their way into less-affluent neighborhoods that would likely be overlooked as a home to traditional docking stations. The proliferation of cheap rides could transform the way thousands of people get around—but opening up that transportation to the masses means taking on society’s good, bad, and ugly, and the dockless rides have already seen all of the above. One of the biggest gripes San Diegans have with the vehicles designed to be left anywhere is that they’re being left everywhere—and sometimes dangerously so. The dockless rides can pop up in the strangest of places and quickly pile up, creating sidewalk traffic jams that rival even Southern California’s highways. But aside from polluting the city’s pathways, the rides have been increasingly tainting its precious natural spaces, including sensitive biological areas and even the ocean itself. And, perpetually exposed to vandalism, sometimes one bike or scooter can become litter in a number of different places. 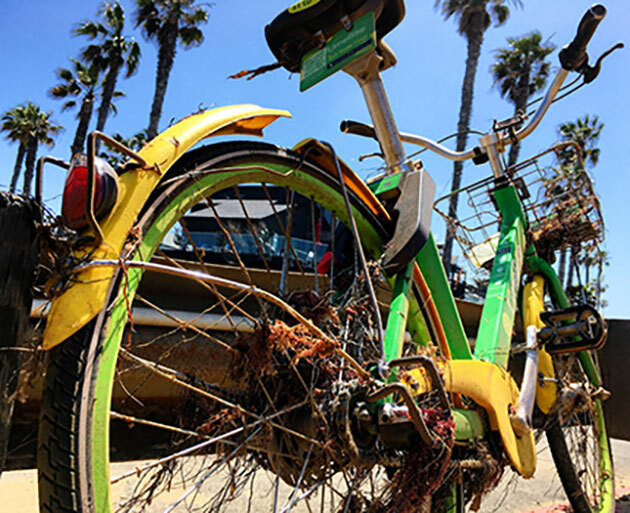 A LimeBike was recently pulled from the surf in San Diego's Ocean Beach neighborhood. Photo by Bridget Clerkin. To help combat the vandalism issue, the representatives said, they reach out to local business owners to see if they’d be willing to let the scooters stay on or near their property overnight. The app also allows users to “score” a previous rider’s parking job to encourage safer placement. LimeBike, which offers an array of vehicles across the San Diego area, including pedal bikes, e-bikes, and scooters, will also periodically send a crew out to clean, re-charge, and redistribute, representatives said. But representatives with Ofo, another dockless bike company, told city officials that if one of their bikes isn’t broken, it’s essentially on the street 24/7—and subject to anything, or anyone, it may encounter. Yet even after the meeting, the lack of local responsiveness from such companies has proved a sore spot for many, and the unwelcome aspects of the communal cycles have residents and local governments alike pushing back on the dockless transportation, insisting on at least a few boundaries. But not all movements to confine the freewheeling rides have been successful. The dockless phenomenon was legally welcomed to San Diego this January, after it was decided that the transportation didn’t conflict with the city’s preexisting contract with traditional docked bike share company DecoBike. Yet nearly as soon as the cycles and scooters swept into town, they were hit with some serious backlash. Petitions to limit or outright ban the transportation were quickly produced in several neighborhoods around the metropolitan area, including the La Jolla and Little Italy neighborhoods. Wielding slightly more political autonomy, citizens of the well-off island city Coronado, located just across San Diego Bay, were able to officially put an end to the programs, declaring the vehicles a “public nuisance” and impounding every dockless bike or scooter on the island. And across the area, business owners have petitioned the government for a temporary reprieve from the rides until new rules can be written. But with the new-age rides only now starting to push eastward in earnest, much remains to be seen on how the country will ultimately metabolize the concept. Taking flight may have been easy, but now the Birds—and the others—need a soft place to land.